In May 2008, the financial crisis had begun and students from across the state rallied at the Capitol in Sacramento advocating against then Gov. Schwarzenegger’s proposed education cuts. The event, known as March in March, is organized to support community college student leaders, by engaging in legislative visits at the Capitol building to advocate for or against bills that may affect community college students statewide. 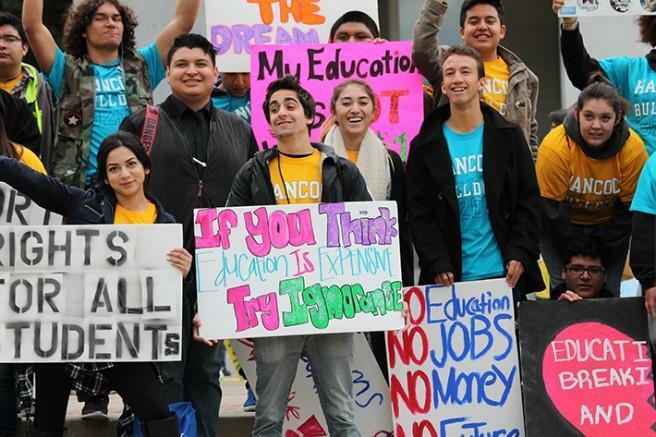 The Student Senate for California Community Colleges (SSCCC) will not be organizing a March in March event this year, though it is possible an event could be planned in April. The two issues surrounding the cancellation were availability and funding, according to March in March taskforce chair Gerson Liahut-Sanchez. The SSCCC doesn’t have enough money to hold the event in March, though Liahut-Sanchez feels that by April there will be more funding. Due to budget increases rather than cuts in the past three years and low student attendance, Liahut-Sanchez said a new kind of event needs to happen. “A lot of the students from the southern region that I represent feel that change is needed, the event is outdated,” said Liahut-Sanchez. With the event only drawing 100 students last year, the SSCCC feels better organization and a more contemporary event would raise student awareness and participation, according to Liahut-Sanchez. “I want to plan a good event for my students,” Liahut-Sanchez said. A letter will be sent out soon updating the constituents of March in March, according to Liahut-Sanchez. The American River College student senate body was informed by director of communication Tami Dunning at the Feb. 9 meeting that March in March was canceled. ARC now has limited time to decide where to re-allocate the $12,000 dollar budget set aside for March in March. Dunning clarified that, while the money ARC budgeted for March in March doesn’t help SSCCC, Student Senate did donate money to SSCCC last semester. Justin Nicholson, chair of the March in March Ad-Hoc committee, stressed that the board needed to act quickly in regards to the money it already allocated. Nicholson suggested that there be some internal event for higher education on campus, while director of finance Jeremy Diefenbacher feels that using their energy on the upcoming elections would be better. Director of legislative affairs Laurie Jones wants to see an event happen. The SSCCC created the March in March task force to set up the theme, date, and location for the event. For now, all ARC student senate discussions regarding March in March have been indefinitely postponed. Be the first to comment on "Annual student rally March in March canceled due to lack of funding"